Into us via a News Tip from Professor Pickle are more kind words from an E3 playthrough of Sonic 4’s Splash Hill Zone–this time from Destructoid. This works out to a Sonic game that feels just like the old ones. Watching the game before playing had me concerned that it wouldn’t, but when I finally got my hands on it, it felt good. It felt familiar. While Sonic’s jumping spin animation looks slow, its functionality isn’t. His left-to-right movement seems to move exactly where I point him, and landing on targets, bumpers, and over spikes is just as intuitive as it used to be on my trusty Genesis pad. I really dig the retro touch in the musical score. The music is classic Sonic, as they brought the original composer back to do Sonic 4‘s score. It sounds like it’s played back with 16-bit synthesizers, but this time with CD-quality audio. This is a nice parallel to the game’s visuals, which look like the old games, but have also been improved with technology at the same time. Overall, from what I heard, the music is fun, and very true to the original scores. There’s new “invincible” music, and it’s quite cute. 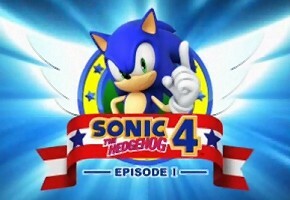 So far, so good for Sonic 4 at this year’s expo–but keep in mind, only the first zone is on display. TSSZ News will continue to bring you new information and impressions throughout the week.